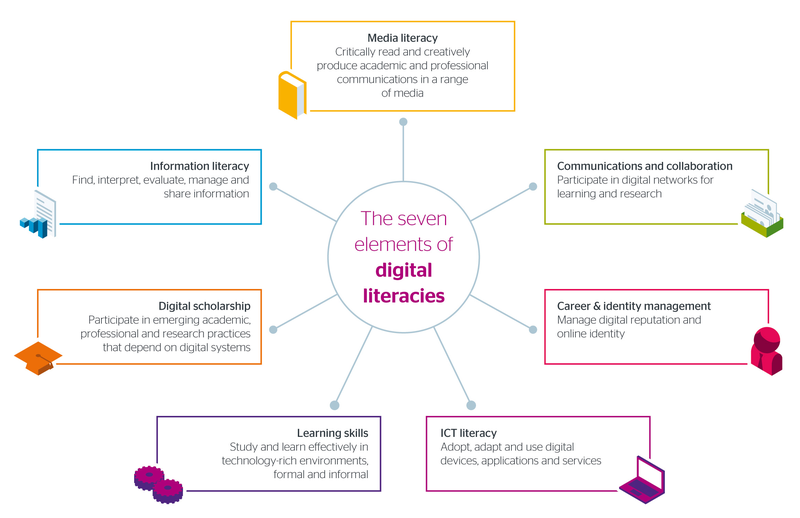 Below is a small sample of references to visualizations that help to convey the interrelated skill sets that comprise digital literacy or are infographics related to digital literacy in general. These resources have been placed in a table with notes (see below) that can be searched and sorted. The table has multiple pages; pagination links appear at the bottom of the page. User may wish to find a fuller range of images by conducting an image search. Note that these images are used for educational purposes only; the original creators and publishers, as cited, retain all rights. Chen, Alice. “Alice in WonderTech: The 9 C’s of Digital Literacy.” Alice in WonderTech (blog), March 1, 2015. http://wondertechedu.blogspot.com/2015/02/the-9-cs-of-digital-literacy.html. Hibberson, Scott, Esther Barrett, and Sarah Davies. 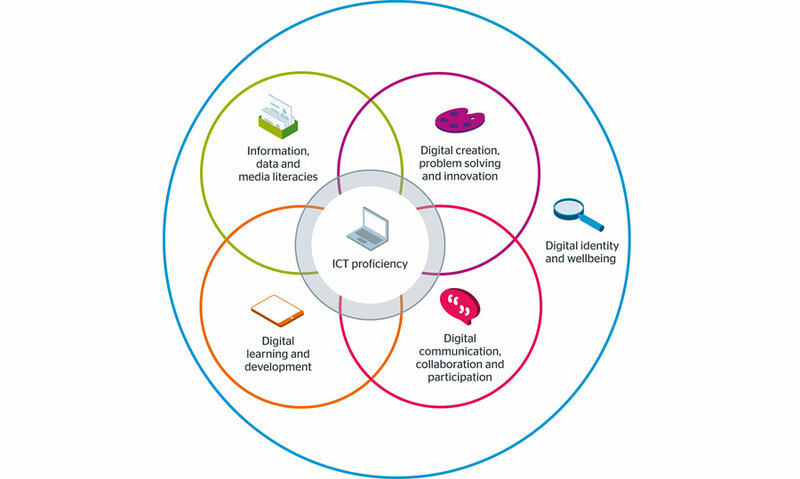 “Developing Students’ Digital Literacy.” Jisc, September 22, 2015. https://www.jisc.ac.uk/guides/developing-students-digital-literacy. “Infographic: The Overwhelming Demand for Digital and Technical Skills.” Eye of the Intern, July 16, 2014. http://www.internships.com/eyeoftheintern/uncategorized/infographicdigital-technical-skills-gap/. Jisk. 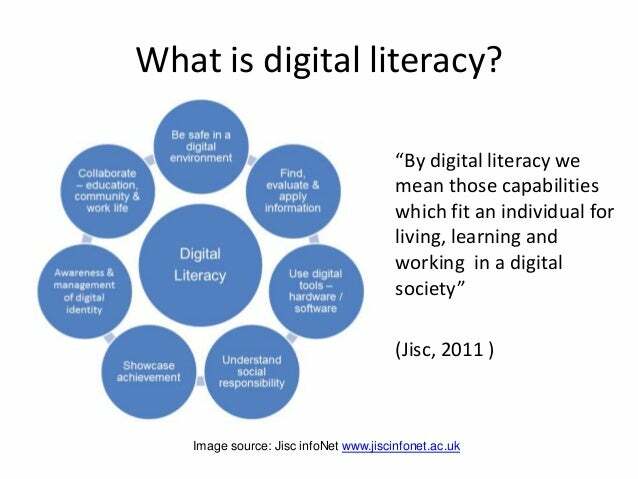 “Developing Digital Literacies.” Jisc, December 16, 2014. https://www.jisc.ac.uk/guides/developing-digital-literacies. Media Smarts. “Digital Literacy Fundamentals | MediaSmarts.” Media Smarts: Canada’s Centre for Digital and Media Literacy. Accessed November 23, 2017. http://mediasmarts.ca/digital-media-literacy-fundamentals/digital-literacy-fundamentals. Myles. “Digital Literacy.” iCreate. Accessed November 23, 2017. http://mylestech.weebly.com/digital-literacy.html. Parcell, Lis. “Digital Literacy for Glyndŵr University 170913.” Education, 02:28:39 UTC. https://www.slideshare.net/lisparcell/diglit-glyndwr-170913. Weston, Crispin. “Good Lord! Where’s the Digital Literacy?” Ed Tech Now (blog), March 23, 2013. https://edtechnow.net/2013/03/23/good_lord/. 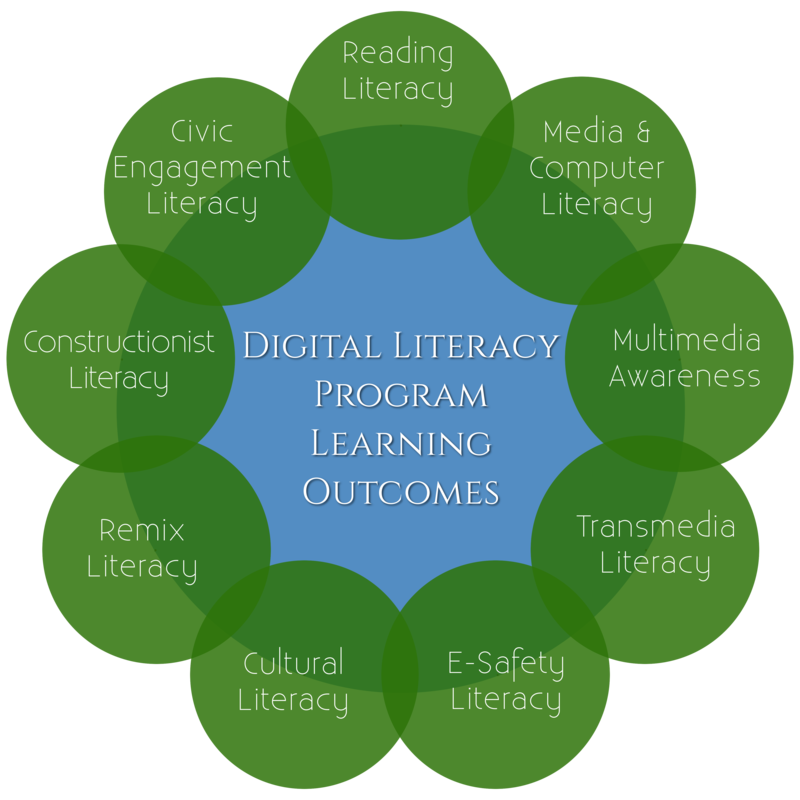 This model illustrates the many interrelated elements that fall under the digital literacy umbrella. These range from basic access, awareness and training to inform citizens and build consumer and user confidence to highly sophisticated, and more complex creative and critical literacies and outcomes. 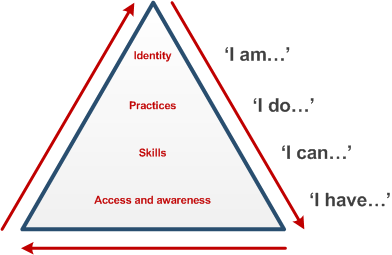 There is a logical progression from the more fundamental skills towards the higher, more transformative levels, but doing so is not necessarily a sequential process: much depends on the needs of individual users. This figure is based on models from the Report of the Digital Britain Media Literacy Working Group. (March 2009), DigEuLit – a European Framework for Digital Literacy (2005), and Jenkins et al., (2006) Confronting the Challenges of Participatory Culture: Media Education for the 21st Century. http://www.newmedialiteracies.org/files/working/NMLWhitePaper.pdf  Jenkins, H. et. al. (2006). Confronting the Challenges of Participatory Culture: Media Education for the 21st Century. MacArthur; Chicago Ill. p 4.